The good news is that the trend for impulse booking has seen a recent surge as consumers search for last-minute deals on flights and hotels. With online booking platforms and the option to view virtual tours, chat with hotel representatives online and book instantly, the hospitality industry has seen a 150% surge in travel-related searches for &apos;today&apos; and &apos;tonight&apos; in the past two years. Lets consider a scenario. Youre out shopping for a few household items at a local Target or Costco, but while you cross those items off your list, you come across some tempting, unrelated deals. Maybe a great deal on a new TV or electronic, a decorative item for the house, a luxury skincare item, or a gift for a loved one. In the first scenario, you fill up your cart and head for an open check-out lane. In the span of a few short minutes, youre out the door and unloading your haul into the trunk of your car. In the second scenario, you fill up your cart and head for the check-out - only to be met with a massive line. After 10-15 minutes of standing, elbows perched on the cart while staring at its contents, you start to second guess that impulse item. Do you really need it? Is it worth the additional cost to your total spend when you just came here for a few things? With time still left to spare, you decide to ditch that item and limit your purchase to the products that you came for initially. - 68% of respondents recognize the need to improve their use of mobile technology to improve the guest experience. The good news is that the trend for impulse booking has seen a recent surge as consumers search for last-minute deals on flights and hotels. With online booking platforms and the option to view virtual tours, chat with hotel representatives online and book instantly, the hospitality industry has seen a 150% surge in travel-related searches for today and tonight in the past two years. Not only that, but more than 60% of U.S. travelers would consider an impulse trip based on a good hotel or flight deal, according to a study that Google conducted with Phocuswright. What does this all mean? With technology catered to the needs of impulse-driven consumers, the travel and hospitality industry is in a position to generate more revenue than ever before - and that opportunity continues far beyond the initial booking. Consider this - the primary pillars in the creation of a successful and profitable guest experience are the provision of value and personalization, and the ability to provide an experience that is efficient and seamless. The modern, digital-savvy guest expects to engage with platforms and businesses that are, too - digital and catered to quick, efficient service. With the help of modern tools for automation and personalization (machine learning and AI, insight-driven PMS and CRM), hoteliers can simplify and streamline the pre-stay and on-property experience like never before. While legacy PMS systems were often burdened with platform limitations, complicated upgrades and manual processes, modern PMS systems enable hoteliers to effectively automate their operational model. With insight-driven, cloud-based technology acting as the backbone of your hotels day to day operations, your team can easily offer appealing upgrades, add-ons and upsells at each guest touch point. Hoteliers no longer have to push their staff to sell, because modern PMS technology automatically provides them with the tools to better engage with guests, individualize their experience and drive revenue. Hoteliers need to take advantage of point of sale opportunities like event tickets, spa treatments, happy hour, upgraded room type, breakfast or spa packages, early check-in or check-out later for a nominal fee. For those guests who prefer an efficient, low-touch experience and opt for a self-service kiosk, automated upgrade and offer prompts will become available to them throughout their navigation of that platform. This allows them to consider that purchase opportunity without any pressure from hotel staff, and within a process that is as quick and seamless as the tap of their finger. Why is this so effective? Because the offer is not only incentivized to their experience, but it is entirely convenient and accessible in nature. At the end of the day, upselling/cross-selling isnt just a sales tactic; its a guest happiness tactic that can help you build deeper relationships with guests by delivering more value. Impulse purchases account for a significant chunk of the consumer spending pie  so hoteliers should invest in tools that encourage merchandising strategies to guests that not only enhance the guest journey - but also boost the hotels bottom line. Sounds like a real win-win for everyone, doesnt it? Jos has a 20+ year track record in hotel software technology. He began StayNTouch with the vision of re-inventing the hotel PMS technology; making it simple, mobile and transitioning the software to the cloud. Prior to StayNTouch, Jos spent 17 years at MICROS Systems Inc. (Now Oracle Hospitality), as a Senior Vice President in charge of global product development and strategy for the Lodging and eCommerce divisions. During his tenure, MICROS hospitality products became the global market leader growing the companys revenues from less than $300 million to $1.1 billion. 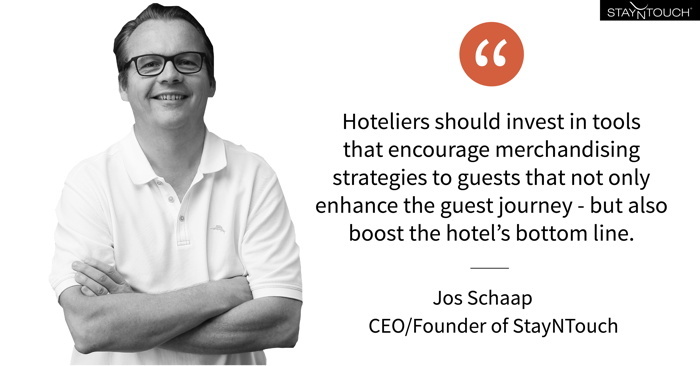 Jos was responsible for introducing a number of new products enabling MICROS to enter all hospitality segments from limited to full-service hotels. Connect with Jos on linkedin.com/in/josschaap. StayNTouch is a Software as a Service hotel property management systems (PMS) company focused on developing solutions that help hotels raise service levels, drive revenues, reduce costs, and ultimately change the way hotels can captivate their guests. Developed with mobility in mind, the pioneering platform enables hotels to create long lasting relationships with their guests by delivering personalized service levels that todays guests require. StayNTouch operates on tablets and smartphones, empowering hotel employees to go above and beyond in exceeding guest expectations at every touch point. Powering over 90,000 rooms globally, our game-changing solution frees hotels from the constraints of legacy or premise systems, dramatically streamlines operations, increases margins, and revolutionizes how front-line staff connect with guests. StayNTouch is a trusted partner to many of the most forward thinking hotels, resorts, casinos and chains in the industry, including Yotel, Zoku Amsterdam, Valencia Hotels, The Freehand Hotels, First Hotels, Modus hotels and the Fontainebleau Miami Beach. To learn more watch our video "THE NEW WAY... TO HOTEL!"